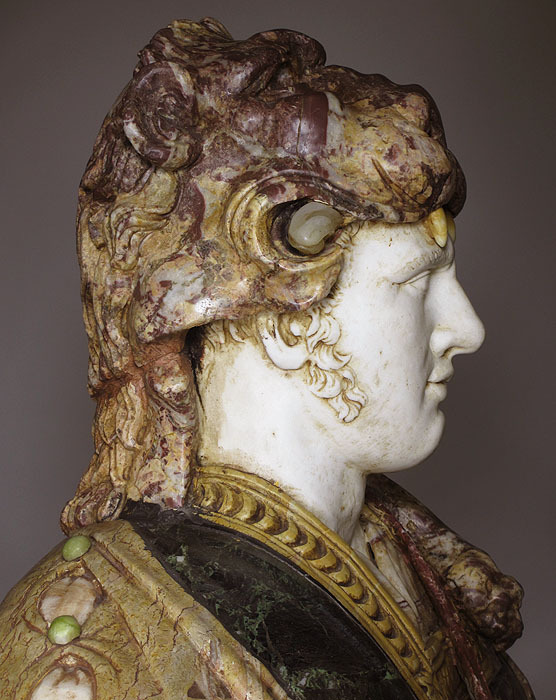 A Very Fine and Life-Size Italian 19th Century Specimen Marble Bust of a Greco Roman Warrior, probably Hercules, after the antique. 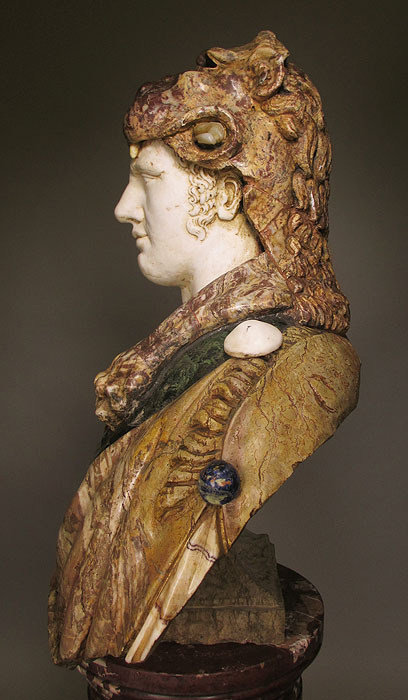 The beautifully carved and impressive bust depicted with a white marble head posing with a direct gaze, his head covered with the pelt of the Nemean Lion, wearing Roman Toga wrapped around his shoulders in a variety of different marble specimens, including Verde Antico, Portasanta, Lapiz Lazuli, Agate and Onyx. 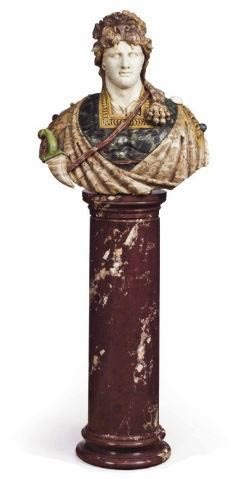 Raised on a cylindrical Rouge Royal marble pedestal. Circa: 1890-1900. For centuries and throughout the ages, the traditional Roman concept of virtue called for old-fashioned morality, which was responsible public bearing, and courageous endurance in the field of battle was represented in portrait art. 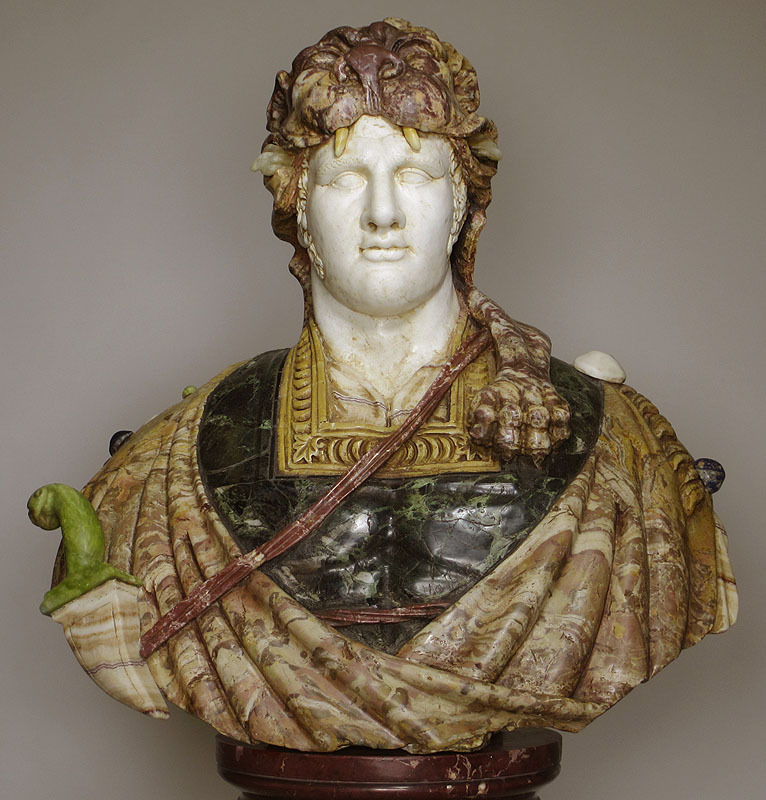 Roman portraiture was one of the most significant periods in the development of portrait art. Originating from Ancient Rome, it continued for almost five centuries. Roman portraiture is characterised by unusual realism and the desire to convey images of nature in the high quality style often seen in Ancient Roman art. 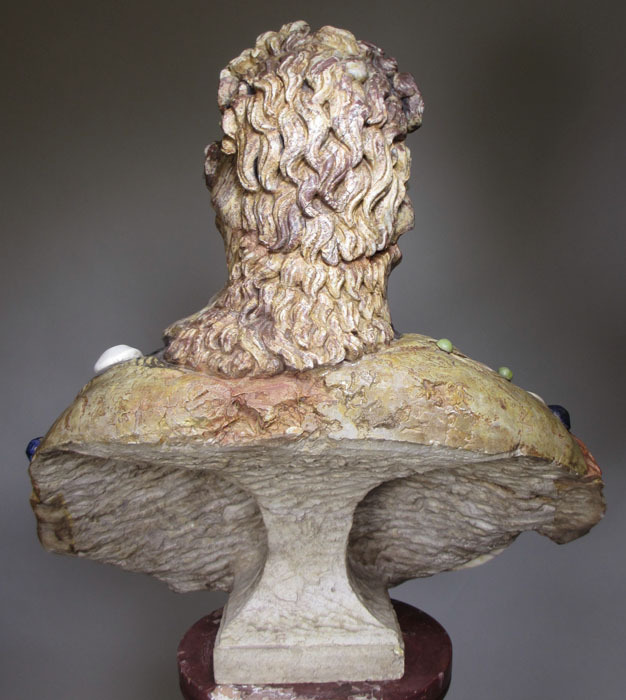 Some busts even seem to show clinical signs. 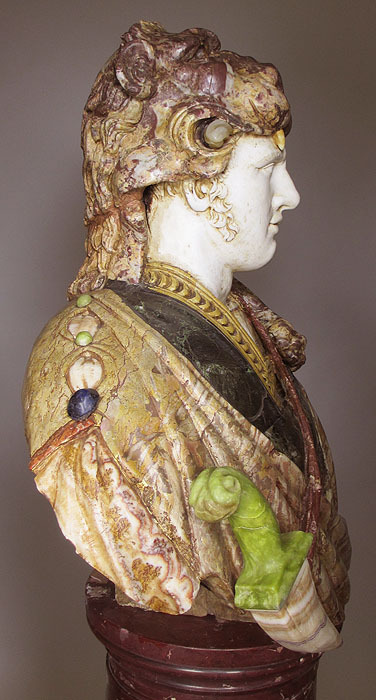 Several images and statues made in marble and bronze have survived in small numbers. 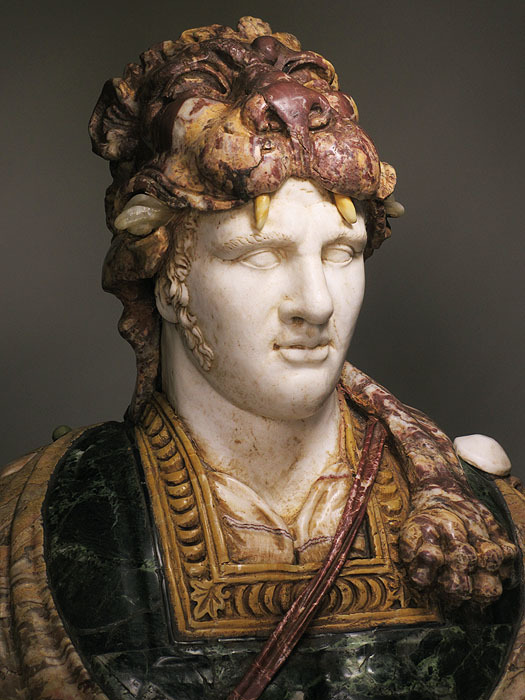 Many Roman portraits are directly linked to specific individuals, such as gods, emperors, politicians and warriors. 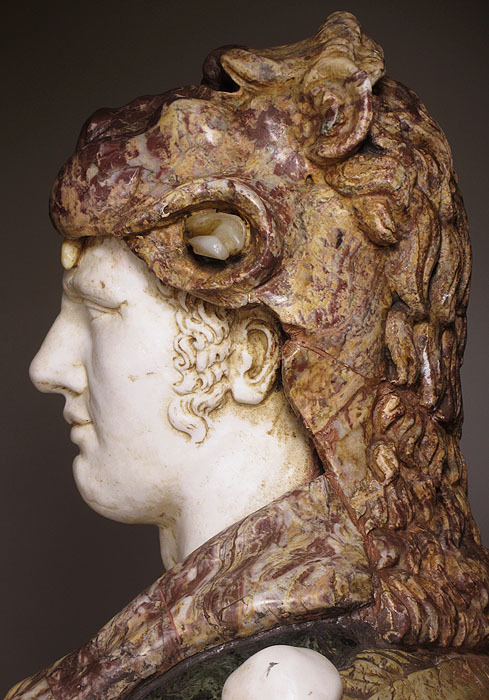 By the imperial age, though they were often realistic depictions of human anatomy, portrait sculpture of Roman emperors were often used for propaganda purposes and included ideological messages in the pose, accoutrements, or costume of the figure. Since most emperors from Augustus on were deified, some images are somewhat idealized. The Romans also depicted warriors and heroic adventures, in the spirit of the Greeks who came before them.The Prestige of of being depicted in such a noble way came as a result of age, experience, values and valor. 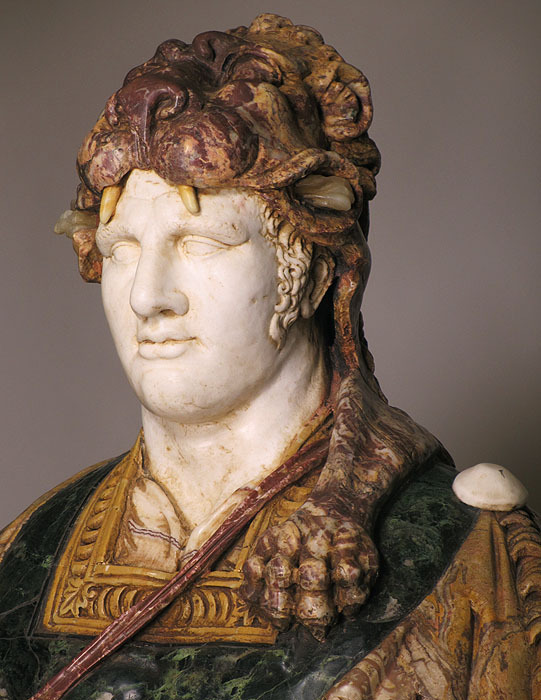 The Roman cultural identity was structured with a profound respect for family and ancestry. These type of sculptures served to advertise the family's illustrious history of public service and to inspire younger generations to strive for such achievements. 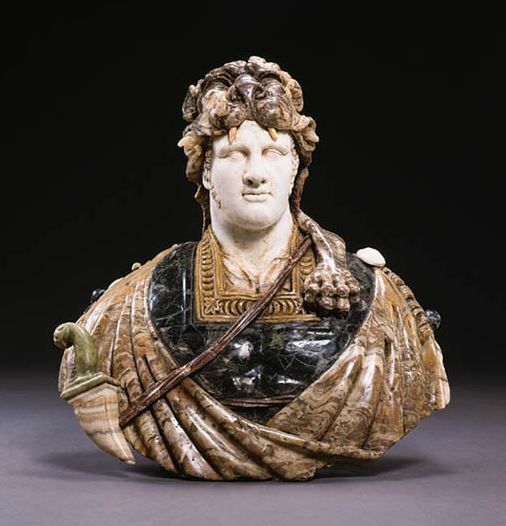 Similarly, "veristic" portraits, so-called because of their seemingly harsh and severe realism, emphasized the solemnity with which the Romans regarded their civic and military responsibilities. Because the Romans considered facial features to be the best conveyors of personality, age and wisdom gained through long, hard years of life experience were accentuated in portraiture in order to project the qualities they valued most highly. Military commanders and politicians were rewarded for their achievements with honorific statues and dedicatory inscriptions erected by their peers or local administrative councils. 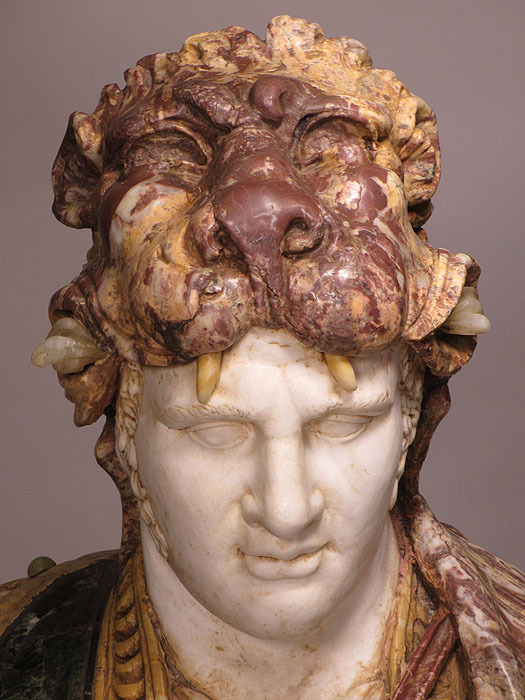 These sculptures advertised the subject's abilities in a public forum, and also elevated his family's standing in Roman society.